If you are an avid mechanic, you know that many of the most common car projects require you to lift your car off the ground. The reason for this is that a mechanic often requires access to hard to reach components and must create space underneath the car. The conventional method to accomplish this is lifting your car with a floor jack, and then allowing the car to rest on a sturdy set of jack stands. However, anyone who has ever changed their coolant, replaced a transmission filter, or swapped their starter can tell you that lifting a car with a floor jack can be rather cumbersome. Fortunately there is another mechanic’s tool that you can draw from your arsenal to aid in lifting a car without having to go through the trouble of lugging floor jacks and jack stands around. This tool is none other than the trusty car ramp, which is usually accompanied by a set of wheel chocks. While ramps and chocks can’t be used for every car repair, there are quite a few where ramps will save you time over using a conventional floor jack. Below is a quick reference table intended to provide an easy and quick comparison before we dig too deep into the article and reviews. The table contains the makes and models of some of our favorites, as well as relative price and average rating. If you want a more in depth look feel free to jump ahead. However, if you only stopped by for a quick recommendation, this table is meant just for you. What are Car Ramps and Wheel Chocks? Car ramps, also called floor ramps, trailer ramps and auto ramps, are quite literally ramps that you can drive your car onto to elevate the front or rear wheels. 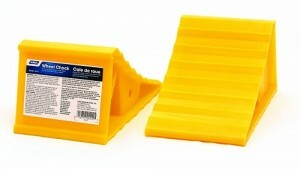 They are most often made of high strength plastic, although metal ramps can also be found. Please be advised that although simplistic in nature, it is ill-advised that you make your own ramps. Each car ramp sold is extensively tested to verify load capacity over a large number of loading cycles to ensure that they are safe. Making a backyard version is a guaranteed way to hurt yourself. Wheel chocks are often used in conjunction with car ramps to stabilize a car once on ramps. Wheel chocks are wedges that you place under a wheel to prevent the wheel from rolling in either direction. Chocks are most often made of rubber, but they can be had in metal as well. When/Why Do You Use Ramps and Chocks? You use ramps and chocks any time you want to raise the front of your car without dragging out a floor jack. You also use ramps when you want to load your car into a trailer or onto a platform, such as for transport and for display at auto shows and car meets. It should be noted that there are some stark advantages and disadvantages to using ramps and chocks instead of a floor jack. The greatest advantage when using car ramps are the convenience factor. It takes considerably less time to drive your car up on a set of ramps and chock one of your wheels than it would to use floor jacks and place jack stands. Since a car ramp has no moving parts, they also don’t necessarily require the use of jack stands to be safe, however using jack stands is always recommended as an added precaution. The most glaring disadvantage to using ramps is that your wheel always must make contact with the ramp. This means that your wheel must remain on the car. As such, you can’t rotate tires, bleed your brakes, change your brake pads, or perform any other type of automotive repair that requires you to remove your wheels. In addition, unlike a floor jack, the height is not adjustable when your car is resting on ramps. It doesn’t take a rocket scientist or astrophysicist to realize that when you lift 3000 pounds of metal and plastic in the air and then climb under it, there are safety concerns associated with this. Obviously, the great danger is that your car can fall, and if it does happen to, preferably you aren’t under it. Fortunately, if you follow some basic safety protocol and use a little common sense, you don’t have to worry about these issues. 1. Always ensure your car is fully seated on the flat part of the ramp. When driving your car up a ramp, make sure you position the car so it sits at the top on the flat spot. Do not park and leave your car on the slope of the ramp. This makes for a less stable scenario where the car can roll backwards. 2. Position your car in the center of the ramp. Wheels should not hang off at all. Your wheels should not hang off the ramp in any direction. A wheel that hangs off the ramp can potentially work the ramp out from under the car by slowly sliding it out of the way. Conversely, if the ramp is well anchored, the forces of having a wheel on the edge of a ramp can actually push your car sideways far enough relative to the ramp to allow the car to slip off. Luckily this problem is easy to avoid. Before climbing under your car, do a quick walk around and inspect each wheel to make sure it doesn’t hang off the ramp at all. If it does, simply back your car down, readjust the ramps, and drive back up. 3. Always chock at least one wheel. This is imperative. Once you have your wheels positioned on the ramp, chock at least one wheel that is still touching the ground. This should not be confused with chocking the wheels that are sitting on the ramp. Doing so will merit you no additional safety benefit. When you chock a wheel, place a chock both in front of it and behind it to prevent that wheel from rolling in either direction. A common mistake is to put the front wheels of a car on ramps and then chock behind both rear wheels. This only stops the car from rolling backwards, when in reality you want to stop it from moving both forwards and backwards. What to Consider When Buying Ramps/Chocks? The nice thing about ramps is that since they are so simple, there are only a few considerations that you must make when purchasing a set. The first thing you need to worry about is the ground clearance of your car. Most ramps will work on most cars, but cars that are particularly low, such as sports cars, exotic cars, and race cars might need ramps that are longer and lower profile. The other thing you have to consider is the weight of your car. Ramps often are rated to a certain capacity, and you should keep this in mind. You don’t want to put your Chevrolet Suburban on a ramp designed to be strong enough to to support a car that is the size of a Mini Cooper or Mazda Miata. If you have a light car, pretty much all ramps on the market will work well for you. If you have a heavy truck or SUV, you will have to pay a little more attention to capacities. You can usually find your car’s weight in the owners manual of on car forums. The typical rule of thumb is that ramps should be able to support more than half of the weight of your car. This will give you enough added safety margin such that if your car doesn’t have perfect 50/50 weight distribution in all directions, you will still be covered. When it comes to chocks, there are even fewer considerations. The biggest ones are that you get at least two chocks, and that they are made from a relatively soft rubber. Hard rubber tends to slide on garage floor surfaces, which can defeat the purpose of chocks. Softer rubber will provide more grip and prevent slipping much more reliably. If you want added safety, consider getting a set of 4 chocks and chocking more than one wheel. The Race Ramps is pretty much the bees knees when it comes to car ramps. This particular set is sold in pairs and has a 3000 pound combined capacity. The RR-40 is 8 inches wide, which will fit most tires including wide tires for some sports cars. 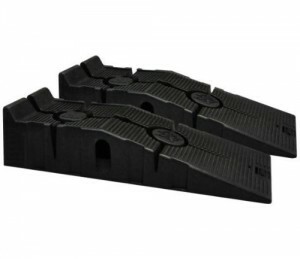 These ramps feature a special construction designed to reduce weight and maximize strength. The materials chosen are extremely durable and these ramps have a solid core, which gives them excellent resistance to compression when your car is placed on top of them. These ramps are relatively steep; they raise the car 7 inches off the ground over their 40 inch length. If you have a particularly low car or a car with a long nose, you will need to exercise caution as you may scrape going up. 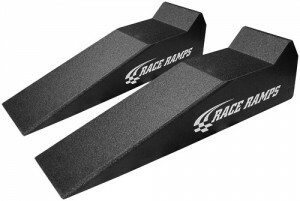 Never fear though, as Race Ramps makes this same identical set of ramps in both a 56 inch two piece construction variety and a 67 inch two piece variety which will accommodate even the lowest of cars. In addition to offering a variety of options, Race Ramps brags that their ramps are “unscootable” in that they won’t slip on your garage floor at all when you try to drive up them, which is a common problem with some of the cheaper ramps on the market. In addition, the material they use is specifically designed not to leave any scratches or marks on your garage floor. 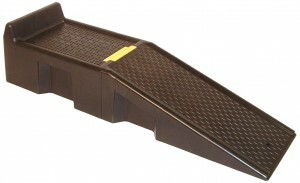 These ramps are an all around great buy and a great value for a top of the line ramp. The RhinoRamps are the budget play when it comes to automotive lifting ramps. They boast non-skid material that will prevent slipping on pretty much any surface, as well as possess structural design that is extremely burly and sturdy. It should be noted that these ramps will not resist slip quite as well as the Race Ramps listed above if you have a particularly slick garage floor, but on most normal surfaces they will perform just as well (a trick if your garage floor is finished with paint or an epoxy that makes it slick is to buy a cheap and thin floor mat to place under the ramps to prevent the from slipping). These ramps have a rather high capacity at 12000 pounds for the pair. These should be sufficient for most trucks, vans, and SUVs. They should by extension be more than ideal for economy cars and sports cars alike. They have a 17 degree incline which is actually relatively steep so this may present a problem for particularly low cars (if this pertains to you check out the longer versions of the Race Ramps mentioned above). The RhinoRamps also feature a width of 9 inches, which is great for vehicles with wide tires. These ramps will raise your car an additional 6.5 inches off the ground, which means that you should have ample clearance to slide under your car to do an oil change. All in all, despite the minor shortcomings of this ramp compared to some of the more expensive ramps, this one absolutely will get you by in pretty much any situation and absolutely can’t be beat for the price. You should have no reservations about picking a set up. In all honesty, there really isn’t a whole lot to say when it comes to reviewing wheel chocks. Are these good? Yes. Are they sturdy? Yes. Are they cheap? Yes. Do they look cool because they’re yellow? Yes. Other than that, the plastic on these is medium hardness and is sufficiently grippy on most surfaces. In addition, the plastic has UV blockers so it will resist degradation over time. Finally, it should be noted that these will fit tires that are up to 26 inches in diameter. If you desire chocks with a softer rubber, another great recommendation is the Race Ramps Rubber Wheel Chocks which are extremely nice and grippy. Aside from the rubber compound, the Race Ramps chocks are otherwise pretty similar to the Camcos albeit they will cost you a little more coin. So now you should have a pretty good idea regarding what to look for when selecting a ramp and chock set. It’s important to remember that there are tons of great options out there when it comes to these types of tools, so if the above aren’t quite the right fit for what you are looking for, take a look to see if something suits you a little better by clicking here to explore other floor ramp options.